Welcome on board one of the most popular business jets in its segment. This aircraft features a stand up cabin (1.73m) with a climate control system that ensures a comfortable temperature when you arrive, be it winter or summer. 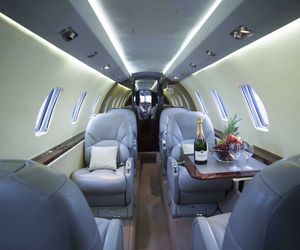 The Citation Excel and its freshly refurbished interior gives you a feel of comfort and luxury that is usually reserved for mid-size business jets and it takes you non-stop between the most popular city-pairs in Europe. Request a quote on your journey today!